David Alfaro Siqueiros 1896-1974, was born in the state of Chihuahua in northern Mexico and was one of Mexico's three great Mexican Muralists of his time. 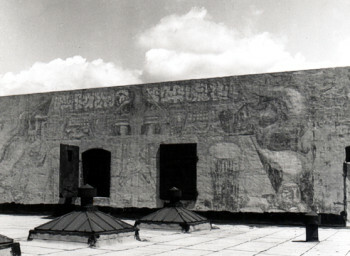 While in Los Angeles in 1932 Siqueiros painted the famous "America Tropical" mural on the exterior wall of the Italian Hall. The mural was whitewashed within months of its completion because of its anti imperialist theme. Over the years the colors bled through the coating and the surrounding community, aware of its presence, was able to view this symbol of Mexican art and human struggle from the south, east and west. 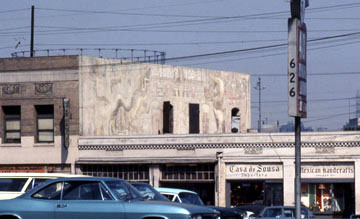 During the Chicano Student movement of the 1960's, teachers, students and community members raised the issue of the mural's cultural and historical value and by 1971 after many classes and articles by Chicano intellectuals a "Save the Mural" committee was formed by Jesus Salvador Treviño and others. Today the Siqueiros mural project, in conjunction with the City of Los Angeles and the Getty Conservation Institute has conserved the mural and has developed plans for exhibits and a viewing platform for visitors to Olvera Street.